“The human race is really starting to feel the consequences of their actions. One area we are waking up to is the massive amount of pesticides we spray (especially in North America) on our food that has not only been linked to human disease, but a massive die off in the global bee population within the past few years. David E. Gumpert writes in the excerpt below about how some American food rights activists have recently taken their cause to the people by running for political office, in some cases against their former oppressors. Michael Schmidt has more than once sought political office, and though he was able to garner considerable support, he was not able to break through the obstacles that were put in his way, possibly in some cases, by those with a vested interest in the status quo. “GUELPH, Ont. — Science-based evidence in food safety seriously compromises any argument for allowing raw milk to be freely sold to Canadians. Even a small amount of raw milk can seriously harm a child, a pregnant woman, the elderly, individuals with a compromised immune system, or anyone for that matter; just one glass will do it. Congress to end prohibition in U.S.? Raw milk prohibition, that is. “Buying and selling raw dairy products across state lines has been outlawed in the U.S. since the late 1980s, when the U.S. Food and Drug Administration (FDA) decided that Americans were no longer free to make their own food decisions without government approval. But this senseless and unconstitutional policy of prohibition could soon become history if a bipartisan effort to restore food freedom reaches a breaking point in Congress. Tagged as congress, interstate, prohibition, raw milk, real farmacy, U.S. 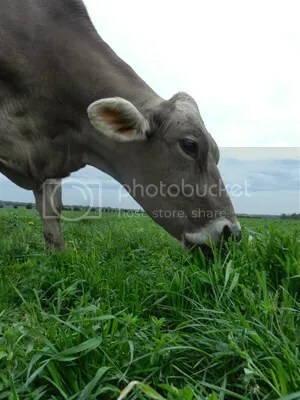 If a cow grazes in a field and no regulator watches, does she still give milk? Photo from the Midlife Farm Wife. “Illinois Farm Bureau recently posted on their web site their view of the current raw milk battle in Illinois and although I do appreciate their moderate transparency , I certainly do not appreciate their very wishy washy stance, but I have never been a big fan of wishy washy in any arena. Interesting how IFB “supports” the consumers right to choose. Since when do Americans need any organizations support to make our own choices? And the reference to some oversight is a blatant lie. The oversight has mushroomed from one small page to several pages of rules and regulations that if passed will be extremely detrimental to small raw milk farmers and consumers alike. And why must the milk only be picked up at the farm? Several members of the dairy work group specifically stated they would be willing to endure more testing, and inspecting to ensure a safe product, if allowed to sell at farmers markets retail settings. But they were ignored and IDPH flipped over on them taking those (still proposed) additional testing and inspecting requirements and applying them to ALL raw milk producers, even those with JUST ONE COW OR GOAT! Jim Fraley, author of the recent article has visited our farm and drank our raw milk. He has sat across from us as we all attempted to work together on the ill-conceived Dairy Work Group Committee created, controlled and disbanded (before any real consensus was reached) by the Illinois Department of Public Health (IDPH) in 2013. He verbally supported the raw milk farmers and consumers who served on this committee and in fact when the group often came to a standstill where common ground seemed unobtainable, it was Jim who stood in front of both sides and pulled us towards goals we felt we all could live with. Keith and I felt like he was really hearing small raw milk farmers, and that he was well representing our concerns to the group HE worked for, The Illinois Farm Bureau. Read more on Midlife Farm Wife. Note: It’s been a couple weeks since this story was originally posted. 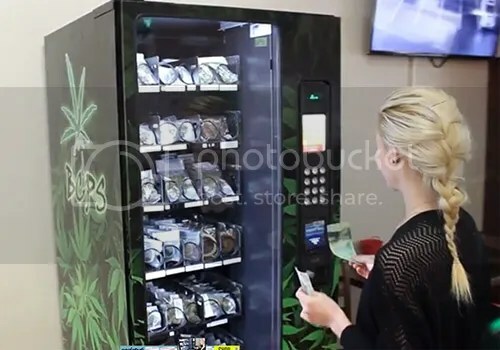 Canada’s first pot vending machine! How about a raw milk automat next? Regular readers of The Bovine will know that we have periodically featured stories about raw milk automats that seem to be pretty much the standard form of off-farm raw milk distribution throughout Europe. Any thinking person would wonder why we don’t have them in North America. We could talk about how it’s illegal here and how some jurisdictions (BC) even try to label raw milk an inherently hazardous substance, but more likely the deep reason is that the dairy oligarchs have a low tolerance for competition. "The Devil in the Milk" -- Dr. Thomas Cowan on how the A1 - A2 factor explains why even raw milk sometimes does not seem to be enough of an improvement over "store-bought"
Chemical agriculture is one of the most polluting and dangerous industries on the planet today. What can we do?